Wild Cards | Kris Johnson's Blog…sort of. Con on the Cob 2007 starts in about two and a half hours and ends Sunday evening. This is good news for my inner geek and bad news for my aspiring writer. On the other hand, maybe a little geeky distraction is just what I need to push through to 20,000 words. Ideas come from the strangest places, after all. Miscellaneous G™ is one of the organizers. Fantasy artist Larry Elmore will be there. Green Ronin’s Wild Cards expansion for their Mutants & Masterminds RPG. 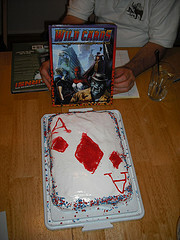 If you’ve been reading KJToo.com for a while, you probably know that Wild Cards is my favorite sci-fi/superhero/alternate history series in the history of ever, and it’s a perfect setting for a roleplaying game. It’s after 1:00 already and I’m carpooling with Gus, who’s going to be here in 30 minutes or so. I’ve got to get ready. Beard pictures when I get home tonight (probably after midnight). The morning Laura and I went to our polling place and cast our votes using the ES&S iVotronic, which is not nearly as nifty (or portable) as some other iProducts, specifically my Apple iPod. I was mildly amused that the machine must be activated by briefly inserting an “electronic ballot” cartridge — roughly the size and shape of an old SEGA video game cartridge — prior to each vote being cast. I was hoping that the ballot screen would be replaced by Road Rash 2, but instead of being able to beat motorcyclists with tire irons and chains I was presented with candidates for Governor, Attorney General, State Auditor and so on. Worst. Game. Ever! So, yeah, there’s a bit of a stigma attached to that name. In related news, Kyle has shown an early interest in the democratic process, and he came home with an “I Voted Today” sticker on his cap. He voted on a modified ballot that included such proposals as fewer naps, later bedtime, decreased border security between the living room and the dining room, and mantadory petting periods with the kitties.